What needs to be done to prepare a game for localization? No matter how much we write about localization, we never run out of topics to choose from. Today we decided to dredge up the past and excavate part of a lecture given by Alexey Medov at HSBI about how to prepare a game for localization. A practical guide featuring all your favorite examples awaits. Let’s begin. What needs to be done before release? First of all, localization should be planned. There are a lot of points in a game where you may make mistakes right from the beginning if you forget about localization. You should start by choosing the languages that you plan to translate the game into, and take into account the requirements of these languages as you develop the interface: one word in German is sometimes longer than an entire sentence in other languages. Russian text generally has fewer symbols than corresponding English text, but will take up more space. To simplify the graphic localization phase, don’t insert any text into the graphics. If you create a picture with text, you’ll then have to extract that text, decode it, translate it, re-draw it, and re-insert it back in so that nothing breaks. Formatting tags and function tags. Make use of many different tags that will help you insert all sorts of variables. For example, variables that will affect the design, that will allow you to later insert objects (placeholder), that will allow you to insert numbers, or to change the gender of the character who is speaking, etc. 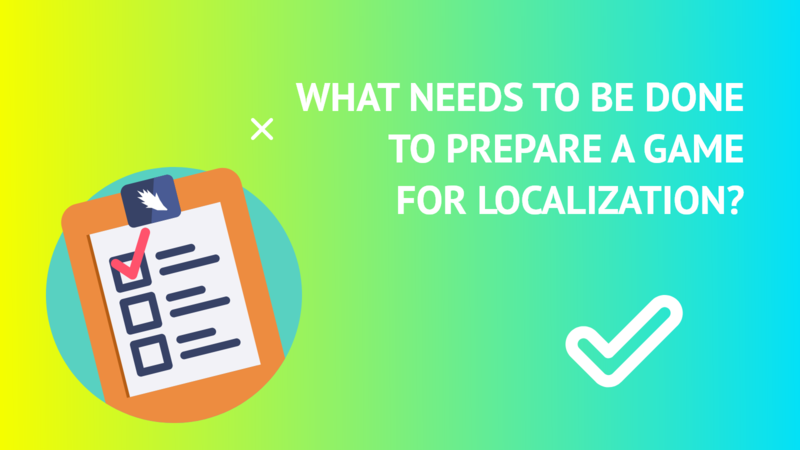 What does preparation for localization include? A lockit. ‘Lockit’ is a shortened version of the phrase ‘localization kit’, and is a complete information package. Localizers like it when they receive data for translation in these formats: xls, txt, xml, html, csv, java, json. These are the preferred formats because they are the ones accepted by the most commonly-used translation programs. Segmentation. Don’t split sentences into several segments. For example: a sentence in Korean always ends with a verb. If you split a Russian sentence into several parts, it makes it very difficult to translate. Context and illustrations. It is very important to give translators context. If you need the word ‘pipe’ translated and you don’t provide any context, there’s no way for the translators to tell whether you mean a smoking pipe, a musical instrument, or a plumbing fixture. Symbol limits. Try to make limits as unrestricted as possible. They can never be big enough. Filters and sorting. Localizers are experienced people, so don’t try to help them by filtering or sorting text or removing repeats. Just give them the text in its logical order. Dialogues with speaker identities and character biographies. For example, Korea has a very rigid social hierarchy. If your game involves communication between characters, it’s very important that the localizers know who they are to each other, as well as their gender, age, social status, and family relations. Let’s assume a simple game where two characters are talking. No Korean translator will be able to translate it without knowing who these characters are to each other. ID helps localizers understand the context; symbols, pictures, original source text. Add a comment if it’s needed. Everything will be crystal clear going forward. Everyone knows that it’s very difficult to work without а project specification. What information do the localizers need from this document? The communication style (formal or informal, censored or vulgar), how the player is treated and spoken to (respectful/familiar), the audience (if we don’t know that it’s a game for kids, we will translate it as if it was for adults, which can result in some awkward situations later on), forbidden symbols, and other technical restrictions (for example, sometimes straight quotes or em dashes can’t be used, and sometimes it’s the other way around). It’s best to mention all these details in advance, so that everything will work correctly. A glossary is a list of game terms and realia which should have the same name everywhere they appear in the game. The glossary usually includes items, character names, quest names, spells, and everything else that should have only one name. This will help you avoid situations where a quest directs you to find the Sword of Truth, and the item is actually called the Blade of Verity. One mismatched term can make your game impossible to play through. Once everything else gets worked out, we have to remember that there are always unique aspects (cultural and legal) to consider when entering foreign markets. Censorship is a scary thing that can be seemingly arbitrary and is established by the authorities. The standard practice includes defining four criteria by which the game can be banned entirely or re-released only after some patches. These are generally unpleasant situations that cause financial and reputational risks. That same one that is written by the winners. Each country has its own alternative history. This includes its understanding in general, as well as some controversial points. An example: Age of Empires, the well-known game released in 1997. It was banned in Korea because of the episode where the Japanese army invades Korea and effortlessly captures the entire Korean peninsula. Historians confirm the historical accuracy of this episode, and the game shows it as plausibly as possible. But the Koreans decided that it was shameful, and suggested changing it to look like they did not just surrender the land, but waged bloody battles. And so the developer had to create a patch where the strong Korean army bravely fought against the Japanese. A second example is Six Days in Fallujah. The action takes place in Iraq in 2004. The game is set during a very ambiguous historical moment involving urban warfare between soldiers and locals, and casualties suffered in the war. Outrage and negative reactions to releasing a game about real events that had happened so recently convinced the higher-ups that it was a bad episode to show, and the game is unreleased to this day. Religion is always a sensitive area. The game Kakuto Chojin is an example of this. A fragment from the Qur’an was somehow included in one of the voice lines. Naturally, every Islamic country proceeded to ban the game, and all the work was ruined because of one overlooked point. Resistance: Fall of Man, a shooter from 2006. It turned out that the game includes the wonderfully detailed interior of Manchester Cathedral. The game is quite brutal and has a lot of violence. Representatives of the Church of England were outraged and published a long list of recommendations about how the game needed to be changed. In response, Sony had to apologize, although they left the Cathedral interior as it was, insisting that events in the game were fictional. It’s a complicated issue, and there are lots of debates about it nowadays. Which precedents can we mention? Resident Evil 5, a well known franchise. It would seem that the Japanese company has never had problems with political correctness, but in their video at E3, they showed the protagonist fighting zombies in Africa. There was a village with locals who were all black. This made the short video look like just a white man shooting black men. The developers had to apologize, but the controversy left a bad aftertaste. An example from a mobile game. Pocket God is a god simulator, where you can rule a small island. There are some things that are typical for aborigines, at least, typical in the way we imagine them: totemic figures and palm leaves. And in this game, you can toy with aborigines in a myriad of different ways: roast them in a volcano, drown them, crush them… Public organizations in Australia and Oceania argued that the game exploited stereotypes about native aborigines and was generally racist. This is mostly a problem in China, because this country has unsolved territorial disputes with Tibet and Taiwan. And this leads to situations where many games are banned. We are not talking about strategies, where, for example, Taiwan and China are different countries, although they were actually different countries until 1949. This ban may encompass the most unexpected games. For example, a football management game, which included the Chinese and Taiwanese national teams under their national flags. It’s very difficult to avoid tripping up when entering a specific market, because there are just so many factors to take into account. This has to do with not what might be forbidden at the legislative level, but what can be misunderstood by the people playing the game. This cartoon shows what happens to a game in different countries. A good old ’90s Hollywood action movie is a stereotypical American game. In general, America doesn’t censor a whole lot, except in some cases when hysterical lawyers or societies of worried conservative moms who object to violence in games get involved. Germany has pretty heavy censorship, and there are quite a lot of games which are banned or not available in the open market there. Nazi symbolism or anything even remotely reminiscent of the Third Reich is prohibited. Korea, with their StarCraft Champions, is a stereotypical world eSports leader. And we’ve already discussed Japan. Overall, this picture is a pretty accurate depiction of reality. The effects of cultural background are felt even in genres like match 3. The Western version is at the top, and the Eastern one is below. The Chinese do not really connect with diamonds, sweets, fruits, etc. in the same way other cultures do. If you’ve ever tried Chinese sweets, you know that they are not actually sweet. In the same way that spicy food is normal for them, but not for us, our sweets are simply tasteless for them. Due to the fact that Chinese don’t eat sweets, they don’t stir any emotional reaction in them. Oddly enough, this feature is reflected in match 3 games. They have all sorts of cute animals instead of sweets. China is a very specific country, both in terms of preferences and culture. As we already mentioned, they are very fond of their history and not very fond of Western history. There was one case involving a fantasy strategy game where the developers actually added an entire team of heroes based on Chinese mythology. China has their own version of almost everything you can think of: they don’t celebrate Christmas, the new year falls on a different date, and every holiday is not only on a different date, but also has its own unique attributes. The Chinese are very offended by the West when we celebrate Chinese New Year during our New Year. If we place the symbols of their zodiac (the rooster, for example) somewhere, we chase away the previous year’s sacred animal earlier than it should be done. Here’s a good example: Overwatch held two different events: European Christmas in European style, with even the Chinese character given a Western-style outfit. And then, for Chinese New Year, they changed the design to Chinese style. This is a great example of how to do it right. Attitude towards fireworks: fireworks are often a feature of holiday celebrations for us. In Russia, they are associated with the new year. If we translate a game into English and start a New Year’s event with fireworks, Americans probably won’t understand the connection. They’re more likely to connect fireworks with July 4, their Independence Day. A case from our experience: we had an event text that included tangerines as a New Year symbol, which is quite common in Russia. Our American translator was very surprised, and we ended up replacing tangerines with cinnamon. So, as you can see, linguistic aspects are not the only thing you should take into account when preparing a game for localization. Keep this in mind when you start your next project, and we wish you great games and grateful players. Localize wisely. What is a reskin, or how do you change a game and make it completely unrecognizable? The INLINGO workflow: what does a project manager do? The INLINGO workflow: How do we do voiceover? The INLINGO workflow: what does a translator do?